I woke up this morning feeling sad. So much terrible news. The Sasson family tragedy (please pray for a complete and immediate recovery for the daughter and mother who remain in critical condition: Tziporah bat Gila and Gila bat Francis). And I was walking around this morning wondering why I’m feeling like it’s Av and not Nissan, the month of miracles and freedom and redemption from all suffering—national and personal. Rabbi Nivin reminded us that on Seder night we rocket up to the 49th level of holiness. That I had remembered…. What I had forgotten is that on Seder night we ascend from the lowest depths of constricted sadness and hopelessness: the 49th level of impurity. But not for long, IY”H. So keep cleaning, JewishMOM, you heart and your home. 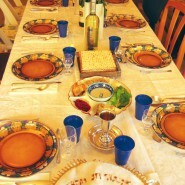 To the land of renewed hope and impossible miracles—-Seder night. Chana Jenny, the corrrect names are Gila bat Frances (the mother) and Tzipora b-t Gila (the daughter). I heard the family’s rav announce these names at the funeral, if you want the source. I’m a bit confused know about the names– have heard two different versions. Where did you hear these names from? The family rav, R’ Ozeri said those names by the funeral. According to the alumni association of the high school Gayle, the mother, attended, the names are Gila bat Tziporah (Gayle) and Tziporah bat Gila (the 14 year old daughter). Yes the names are Gila bs Frances and tziporah bs gila- just listened to audio recording of the father’s Hesped (which was beautiful, heartbreaking, inspiring.. Recommend everyone listen to it) and he said those names. I take back what I wrote before – Ilana is right – Gila bat Frances is the name listed outside the shiva house. oiy too much tragedy! our hearts are broken. Less than two months ago my friend’s young son (36) a father to 7 passed away. Now another father loses seven children. Too much pain. I can’t even imagine the horror of a child abuse ring! I would think that each evil Rosho would be looking out for themselves and not collaborating together to hurt our children. Enough Galus already! I read Rav Berkowitz’s account of what happened and am totally and utterly SHOCKED!!! It sounds so scary and sadistic. My question is…why is this the first time I am hearing about this? Shouldn’t it be everywhere and on the news and on flyers informing us what’s going on so we can better protect our children? How can it be that the police are useless and so unhelpful? I don’t have words after reading about what’s going on. My heart feels broken and so sad….